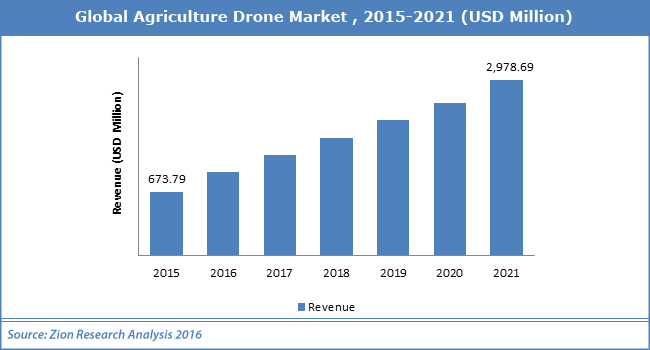 Some of the major companies in the agriculture drone market comprise Google, GoPro, Trimble Navigation Ltd., Boeing DJI, AgEagle LLC, DroneDeploy, Agribotix LLC, AeroVironment, Inc., 3DR, AutoCopter Corp., Parrot SA, HoneyComb Corp., and Yamaha Motor. These players have a significant role in the growth of the agriculture drone market. Analysts at Zion Market Research claim that the global agriculture drone market was capitalized at almost USD 673.79 Million in 2015 and is likely to reach almost USD 2,978.69 Million by the end of 2021, developing at a CAGR of slightly more than 28.11% from 2016 to 2021. As per analysts at Zion Market Research, the increasing automation in the agriculture procedure due to labor crisis such as aging farmers and lack of skilled farmers are likely to have the positive effect on the development of agriculture drone market. A favorable transformation in the regulatory rule is also likely to let the start-ups to work in large and small farming processes and help in water & disease management. Rising tech advancements in tools and requirement for improving the quality of the farming methods have resulted in elevated implementation of agriculture drones. This is likely to boost the growth of agriculture drone market in the years to come. Moreover, modernisms in the GPS mapping field paired with the improvements of solar power drone in agriculture industry is further powering the demand for agriculture drone market. Drones have the capability to implement enhanced plantation with crop rotation tactics and offer crucial inputs associated to the everyday progress of crops, which is additionally adding to the growth of agriculture drone market. For example, in April 2018, a drone from the Landview Drone school for agriculture took off close to St. Paul, Alta. The drone took off about 200 Kms northeast of Edmonton. Nevertheless, firms working in drone software manufacturing systems and designing are gathering the info and combining them into drone, which is additionally likely to surge the requirement for agriculture drone market. The info collected from drones assist the farmers to enhance yields by observing chemical supply in water or fertilizer, and also capable of checking for signs of disease, mapping their fields, saving time in the process, and monitoring crop health. On the other hand, lack of skilled pilots for controlling the drones might hinder the growth of the agriculture drone market. The agriculture drone market is likely to be boosted by North America in the forecast period. On the other hand, Europe is expected to contribute a lion’s share in the overall development of agriculture drone market.